When it comes to finding the right headset, there are several factors that we need to consider before we settle for the right type and brand. Thus, using our favorite search engine, we tend to search for help from others who could give us honest reviews of the headset/s that we are hoping to buy. Product reviews give us ideas about how a specific device functions according to its technical specifications and other non-technical aspects that matters. For a meticulous person like me, I usually make a list of my personal specifications before I decide to buy the brand and model that somehow matches all of my criteria [if not all, it should match at least 85% of my list]. 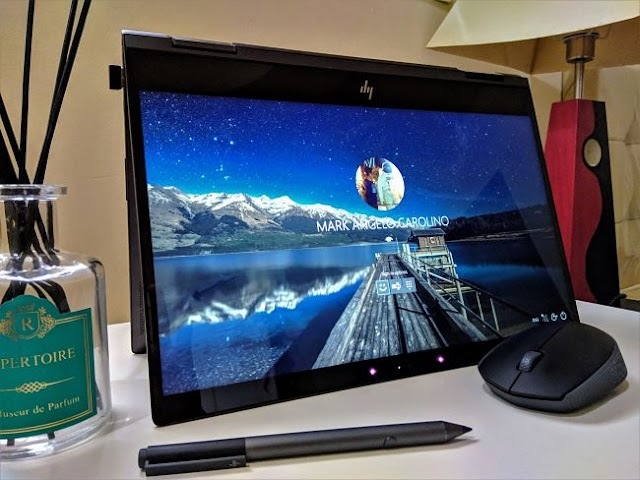 More often than not, I look for the right combination of the design, portability, functionality and of course the right budget for the right gadget. I noticed that in my previous product hunting experiences, only a few products can provide all of those specifics in one. Some models and brands are functional, portable and very stylish but the price just doesn't feel right. Some are cheap but the functionality and design are compromised. It really is just a matter of how to figure out which specification you should prioritize so you could get your ideal product without any regrets after buying it. 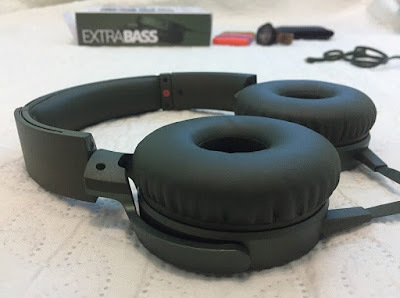 Today, I am going to show you my quick review of the Sony Extra Bass MDR-XB550AP. This is a new over-ear headset that Sony recently added to its 2017 Sony Extra Bass Line-Up of headphones and portable speakers. This isn't a top of the line model, it doesn't have Bluetooth connectivity and NFC but if you're looking for an affordable and stylish headset that can deliver high-quality sounds, just go ahead and read even further. 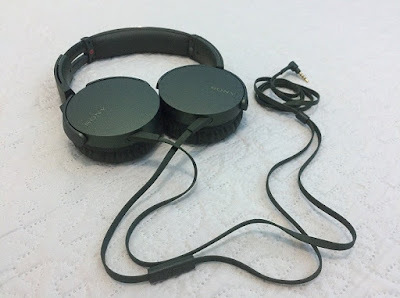 The Sony Extra Bass MDR-XB550AP headset is packed in a clean-looking 195mm x 229mm x 57mm (7.68in x 9.02in x 2.25in) box with prominent "EXTRA BASS" logos on the front and the right face of the box. Attached on its left face is the 1 Year Premium Warranty Card while on its back face, the technical specifications of the product are written in English and Chinese languages [since this model is from Asia]. On the upper right corner of the front face of the box, there is a small holographic Sony sticker to confirm its authenticity. [I should've not mentioned it on this review but in my country where selling product imitations is rampant, it's one good way to help my readers become aware of it especially those who prefer to buy products from re-sellers online]. The box is very light so you'll have a pretty good idea of the weight of the headset by just carrying the box. Unpacking this headset is a little bit tricky. I accidentally tore the box because at first, I didn't know how to get the black box out of its delicate white outer box even if there is a an "Open" sign at the bottom of the box. If you want to save the outer box and prevent it from being damaged or destroyed, there is one easy way to get the black box [which contain the headset] out of its white outer box. Open both openings at the bottom and top of the outer white box, use the white handle to carefully slide and pull the black box upwards. It is not going to be easy as the boxes are tightly packed but it's going be worth it. On my personal point of view, the design of the Sony Extra Bass MDR-XB550AP can be summarized into three words: comfort, flexibility and style. Comfort. The Soxy Extra Bass MDR-XB550AP is designed not only to give quality bass and details to the music you're playing but also to give you a comfortable listening experience. Thanks to the soft cushioned ear-pads which can be worn for a very long time without any discomfort. The ear-pads manage to remain quite cool because of the small rectangular hole on each pad allowing the ear-cups to push air in and out. Though this model doesn't have the noise cancelling feature of MDR-XB950N1, for me, the soft cushions carefully embedded to the ear-cups are enough to keep my listening experience uninterrupted by the outside noise. When I said it is comfortable, I really meant it. I watched a two-hour movie with this headset on and it didn't even heat up. It felt very comfortable to my ears. Flexibility. The adjustable head band and swiveling ear-cup holders will make the Sony Extra Bass MDR-XB550AP fit to almost any head size. It is durable enough to be stretched at an allowable point, thanks to the aluminum band mounted inside to reinforce the plastic parts of the headset. On the functionality aspect, the in-line remote of the MDR-XB550AP acts as an extension of the call answering and ending functionality of the connected smartphone. It can also be used to pause and play music without a need to take the connected audio playing device or smartphone out of your pocket. Style. There are five available color choices that will surely match your daily ensemble. There is red, green, blue, white and black. I've got the green and I really like it. The green, blue and red have a metallic sheen to them, making the colors seem almost electric. The matte black can simply be mixed and matched to any color you want. If you're into mixing and matching color for your daily get-up, the Sony Extrabass XB550AP will definitely not going to disappoint you. As Sony claims that its EXTRA BASS™ line-up is perfected for Electronic Dance Music, the bass quality of Sony Extra Bass XB550AP is indeed pretty good. The thumping sound produced by the bass is simply amazing. Some low frequencies (below 25 Hz) which cannot be heard because these frequencies are lower than what the average human ear can hear, but you really can feel it! These frequency are called "Sub-Bass". The sub-basses are bass frequencies [at around 10 to 20 Hz] that you can't technically hear but can still be detected by your ear. Sony Extra Bass XB50AP is designed to handle sound all the way down to 5 Hz, so you're sure that you get the wholeness of the music you're playing. Sure enough after two days of usage, I felt the real power that this headset could deliver. I even tested playing a compressed mp3 file and it gave me fine bass sound output that I didn't expect from a compressed mp3 file. Its Extra Bass feature lived up to my expectations. Aside from the thumping bass, the other instruments in a music you're currently playing can be distinctly heard through its powerful ear-pad. When I played "Rather Be" by Clean Bandit ft. Jess Glynne, all instruments can be clearly heard which I couldn't hear using my regular in-ear headset. The Sony Extra Bass XB550AP is fairly priced for its type. You can get it for only Php2,999 in any Sony Stores in the Philippines. 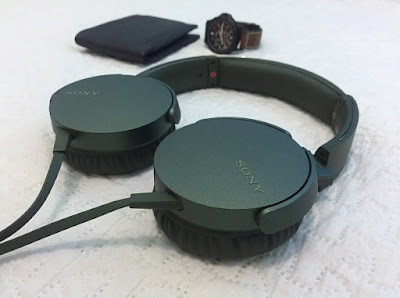 The Sony Extra Bass XB550AP may not be a top choice for audiophiles but for a common person like me who looks for a stylish and functional yet affordable headphone that can virtually take me to any concert hall, to a house party or even to a cinema when I play my music and movies, this is already a top choice. If you love bass and only bass, this product is definitely for you. To finally wrap up this review, here are the pros and cons that may help you decide whether Sony Extra Bass MDR-XB550AP is right for you or not. 1. Clear, rich and detailed sound produced by its default Extra Bass filter. 2. Compact yet flexible design. 6. Built in microphone for answering calls. 7. The flat cords are tangle-free thus make it easier to handle than any rounded cords. 8. Good value for money. No Bluetooth and NFC connectivity.